An introductory course for the outdoors person interested in learning more about the natural world they are exploring. An Introduction to the Natural World course is designed for hikers, climbers, photographers, scramblers, and conservationists who want to learn more about the mountains they enjoy. Using the "Field Guide to the Cascades and Olympics" by Stephen Whitney and Rob Sandelin as a resource, you will learn the basics of how to identify flowers, shrubs, trees, birds, mammals, butterflies and other forms of life. Instructors are volunteers, eager to share their knowledge and enthusiasm of nature. Field trips will be organized with faster and slower paced groups to accommodate all fitness levels. 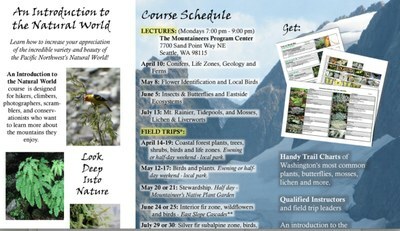 The course includes four presentations at the Mountaineers Program Center at Magnuson Park Seattle, and four field trips (2 local and 2 in the mountains). Participation in all activities is not required. To graduate, submit a list of 100 identified species. We will celebrate your success and get to know other naturalists at a potluck in September. The goal is to have fun and to learn. In addition, class activities include a half day stewardship and plant identificatin session in the Mountaineers Native Plant garden. This activity will appear in the course activities.